Now if you think about it for a moment or two, the legal fraternity is a very strange concept all in all. I just find that their definition of 'justice' is all to do with what they can prove, rather than what is right. Still, it is a nice topic to transcribe into a film I suppose. One Directed by: James Hill; and Starring: Peter Sellers, Richard Attenborough, Beryl Reid, and David Lodge. It was made in 1962, and lasts for 88-minutes. I am afraid to say that it has taken age-ed Barrister, Wilfred Morgenhall (Peter Sellers), an awful long time to get his first 'dock brief' - defending timid wife-murderer, Herbert Fowle (Richard Attenborough). Well, it has taken him years and years of study and personal neglect you see, plus many-many more years doodling on cross-word puzzles, until some criminal decides to pick him from the barrister's chambers. Still, now that someone has, what has he got? Bird-lover, Herbert, is just irritated every time that his wife, Doris (Beryl Reid), finds something to laugh at. He hated her chuckle when they got married . He loathed her jovial jibes at his aviculturist past times. Plus in addition to this, when they both take in lodger, Frank Bateson (David Lodge), who is similarly attuned to Doris in tone, Herbert is aghast when she kicks Frank out, because she does not want to run away with him. In fact, Herbert is so forlorn by this turn of events, that he kills her. Once Wilfred has heard Herbert's strange tale, they both then conjure up possible trial scenarios which will get Herbert off the hook. Firstly, they manifest a 'surprise witness' to come to his aide - something which has its obvious pitfalls. Next, they surmise what would happen if they had the lodger, Frank, on the dock - bad idea, he has an alibi already. And finally, Wilfred devises a plan to attack the medical evidence - ooops - no - not convincing enough I'm afraid. Though, I suppose that is why when Herbert's trial finally begins proper, nothing really turns out the way it would appear. As barristers bumble - juries stumble - criminals find reprieve - and justice has no time to grieve. 'The Dock Brief' is an early sixties English personable drama, devised and staged as if it was theatrical production. 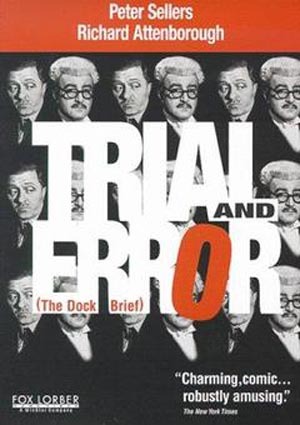 Well, just look at the facts: (1) John Mortimer, the writer of this film, was a novelist, a writer for BBC radio, and originally devised 'The Dock Brief ' for both these mediums plus the theater. (2) The director of this film, James Hill, directed a lot of television programmes in his time, such as 'The Saint', 'The Avengers', 'The Persuaders', 'Worzel Gummidge' and 'C.A.T.S. Eyes'. Oh! Plus the critically acclaimed film 'Born Free' as well. (3) David Lodge starred with Peter Sellers in the television series 'Son of Fred', as well as the 'Pink Panther' series of films too. 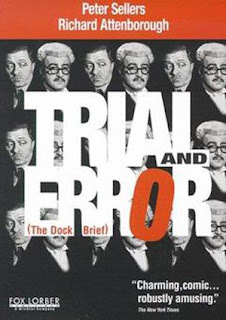 (4) This movie is known by two names - 'Trail and Error' and 'The Dock Brief' - for no apparent reason what so ever. (5) Beryl Reid played the same part of 'Connie Sach' in two films - 'Tinker, Tailor, Soldier, Spy' and 'Smiley's People'. She won a BAFTA for 'Smiley's People'. (6) Richard Attenborough first film role was in 1942 - 'In Which We Serve'. (7) Peter Sellers and Richard Attenborough did star in another film together after this - 'The Magic Christian'. And (8) Back in the day, the people associated with the 'English Law', were from privilege backgrounds only. No 'commoners' allowed. However, taking all of these facts into account, does that make this film with two names a good film or a bad film? Err - it depends' I suppose. Personally speaking, I kind of liked it, because it just has that old school charm of yesteryear, whilst conceptually, encapsulating a number of short associated tales together, by joining them all up as if it was just one solid story. For example, a large part of this tale is about Peter Sellers' character, Wilfred, and how he has had to study very hard to get into the legal profession, only for him to then be shunned by it. Whereas another part of this tale is about Richard Attenborough's character, Herbert, and how he has led a life of drudgery and mixed ideals, which provoked him to kill his irritating wife. Also, in addition to this, this story is 'glued' by a cohesive tale, one relating to Wilfred and Herbert's 'alternate attitudes' towards life and class. OK, I know that this does not sound like a laugh riot film - and to be honest with you, it's not - it can seem quite sad in retrospect. Still, whilst saying all that, this movie is about the comedy of character, and how certain attitudes and personalities seems to have more depth of humor than the overall story. My personal favourite part of this film is where Peter and Richard try to conjure up possible outcomes to the trail. Granted, it is not a realistic depiction of a Barrister and Client relationship - but that is precisely my point - the characters progresses the tale because they are who they are. "And why is that?" you may ask. Simple really - because Peter and Richard (plus David and Beryl) are all great actors, and carry this film from start to finish as if it was a walk in a park. Moreover, the simple and 'plodding' pace of this film is very nice too - with transitions and speed-up effect very well transmitted, conveyed as if I was sitting in the audience of a gala theatre. Oh! I think that is where I came in... huh? Great film - of its time - and a must see for lovers of yesteryear.